Light and Easy to handle.The Inexpensive and universal Self Inkers.The Parnami Self Inking for clear and sharp impression, mechanically compressed foam used which deliver the controlled ink when pressed.The right impression and make your mark by using Parnami the image making brand.The Parnami Self Inking Stamps are available in Three sizes in Your Choice Color. This is a 32mm x 67mm rectangular stamp which are most commonly used for company address stamps. - No need for any stamp pads. here you can buy stamps sitting at your desk. A wide array of stamps to choose from which could be either from our ready made stamps or you can design your own stamp. Combination of plastic self-inkers, daters, numbers and word stamps to satisfy all your office and home self-inking stamp needs. Available with us a wide range of Colop Self-ink Stamps, which holds the capability to convert signatures, logos and photographs in the form of stamp. It comes in varied colors and is considered ideal to provide thousands of favorable impressions. In these stamps, when the ink pad is dried, a new ink pad that can be replaced easily by sliding out the old one. 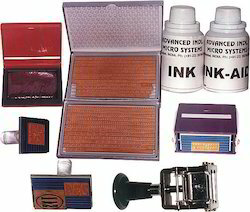 We are major supplier of Self Inking Rubber Stamp in Madurai, Tamil Nadu, India. We are the supplier of self inking stamp and rubber stamp in both blank and with engraving. The self inker is a little more economical, but the pre inked, while more expensive, offers thousands of more impressions without re inking, and the impressions are crisper. Self ink stamps are more effective and time durable. With no need for stamp pads these stamps can be custom made to any specification and usable at the go. Impression Area: 1/2" x 2-1/8"